These are very intense weeks: after the two consecutive races in Valencia and Spa now there is Monza on the calendar, this year's last race in Europe. In Belgium we won and we want to go on like this in the last races, trying to stay on the podium. It's one of the most important GPs of the year, because we race in front of our fans and it would be great to give them satisfaction. The success at Spa was very important for the team: I could see the guys in front of the podium and understood how much this victory meant for them, especially in such a difficult season. It was great for me to listen to the Finnish and the Italian national anthems after such a long time. And it would be excellent to repeat it until the end of the season. Racing in Monza in front of our fans with all the Prancing Horse flags in the wind is a fantastic feeling. I've never won a race in Italy, but I always liked racing at Monza. For me there's no extra pressure, but I know how much the team wants to have a great race here. The track is the fastest of the season and the KERS should help us just like in Spa. You need to use the kerbs well and this wasn't the strong point of our cars over the last years. We'll see what will happen as of Friday. We didn't do the usual test on the track so it's difficult to say because the cars haven't used this aerodynamic set up so far. I'll have a new teammate, Giancarlo Fisichella. I always got along very well with him. 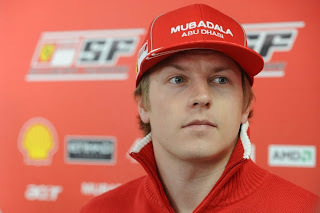 He's one of the most expert drivers and we will give our best to help Ferrari keep the third place in the Constructors' Championship. The performance levels changed from one race to the next this year. There are team like us who stopped developing the car and others making pressure, because there are still several goals to reach. Looking back I'm happy because I'm the driver who gained the most points over the last races (25): who would have said that after such a start of the season? It will be a difficult weekend, but I can promise the fans that we will give our best as usual.